I always feel a bit guilty whenever someone asks me what to do with kids in Plymouth. It’s our closest city as the crow flies. But in the first 18 months we’ve lived in Devon we’ve always gravitated towards Exeter. 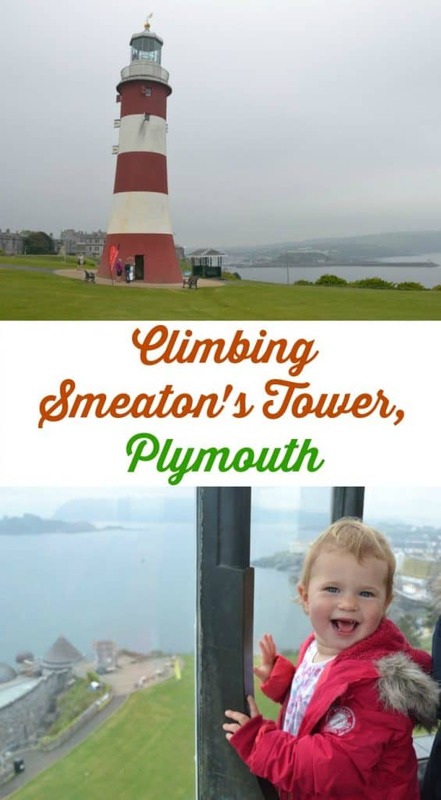 Finally last weekend I visited with the girls and I had the perfect opportunity for climbing Smeaton’s Tower on The Hoe. The Tower was completed in 1759 but not in its current location. It used to stand 14 miles away on Eddystone Rocks as a lighthouse. It was the third of four lighthouses to guard the rocks since 1698 and it’s curved tree trunk-like design was ground-breaking. 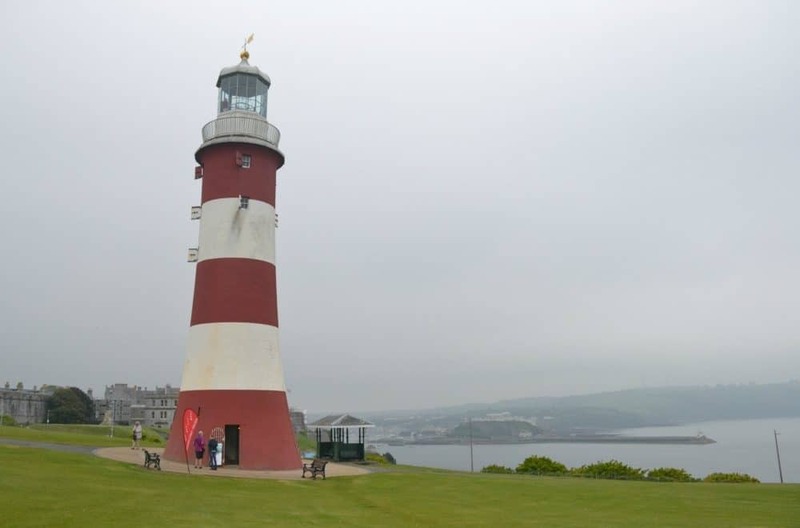 In 1882 Smeaton’s Tower was replaced with The James Douglass Light which still stands on the rocks today. But rather than demolish and lose the iconic tower built by engineer John Smeaton, it was relocated brick by brick to The Hoe on the seafront. Smeaton’s Tower became the new centre piece to the Victorian gardens on The Hoe and still makes quite an impression on the skyline in its red and white livery. I’ve passed it a couple of times while in Plymouth for work but have never had the opportunity to explore it. So, why not climb it with the Tin Box girls? To be perfectly honest I had no intention of going up the tower when we arrived on The Hoe. I had just used it as a landmark for the girls to spot with the promise of an ice cream if we made it there. But when we arrived Tin Box Tot asked if we could climb it. I was a bit dubious as I was on my own with a four and two-year-old. Just think of the trip hazards! But who am I to stifle her explorer spirit? Plus I was curious myself. We left our pushchair with the lady in the tiny ticket office at the base of the tower and began our journey skyward through the 22 meter high structure. The first part of the climb is up carved stone steps and posed no problem for my little companions. In fact, they didn’t bat an eye lid when the steps turned into ladders as we moved upwards through the tower’s six levels. Back when it was in use, the three duty lighthouse keepers had a living room/kitchen with all the mod cons for the time. There was a sink and a stove that kept this part of the tower toasty warm. I was feeling a little flushed by this point of the climb – I put it down to the building retaining that Victorian heat. Ahem! Above the kitchen was a bedroom with three cabin beds. At the very top of the tower, in the glass encased lantern room, there was a chandelier which would have held candles to warn ships about the rocks below. The original chandelier was replaced with oil lamps with reflective backs in 1810 and a replica is now on show. I hadn’t expected it to be possible for me to climb all the way to the top with the girls but it was a really simple exercise. I’m so glad I wasn’t put off by my original concerns as the views were wonderful, even on an overcast day. The whole experience left me feeling elated and you can see from the pictures that the girls enjoyed it too. Entry to Smeaton’s Tower cost me £4 and the girls were free as they are both under five-years-old. Children aged five to 16 can go up the tower for £2. 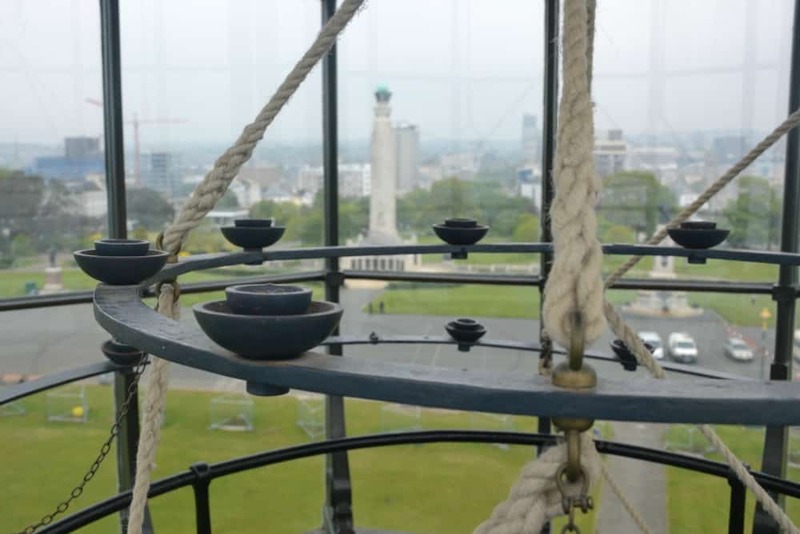 Find out more about visiting the Tower on the Plymouth Museum website. Another way to see the some of the sights of Plymouth with toddlers is to take a ride on the The Mayflower Express land train. It takes a circular route leaving from Plymouth Guildhall down to the Barbican. It then heads towards Smeaton’s Tower on The Hoe and West Hoe Fun Park. Travelling the full route costs £5 for adults and £2 for children aged six and upwards. Fives and under ride free. 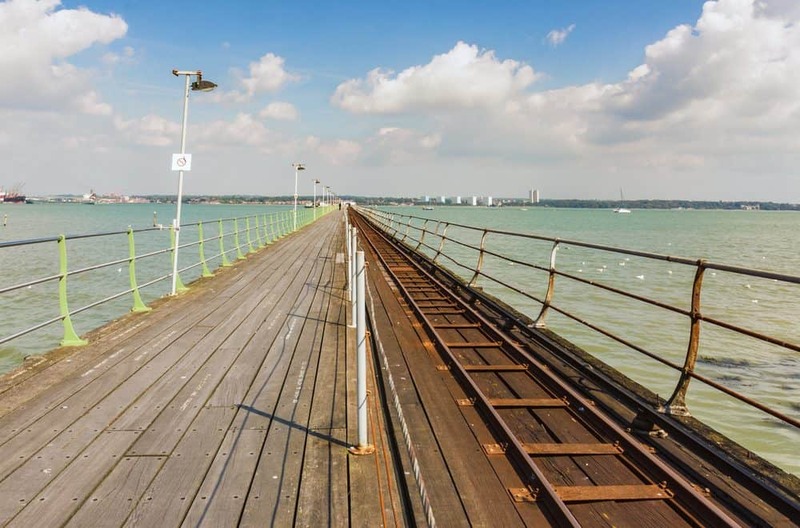 The route takes 40 minutes and runs every hour from 10am to 3pm, six days a week (rest day Thursday). 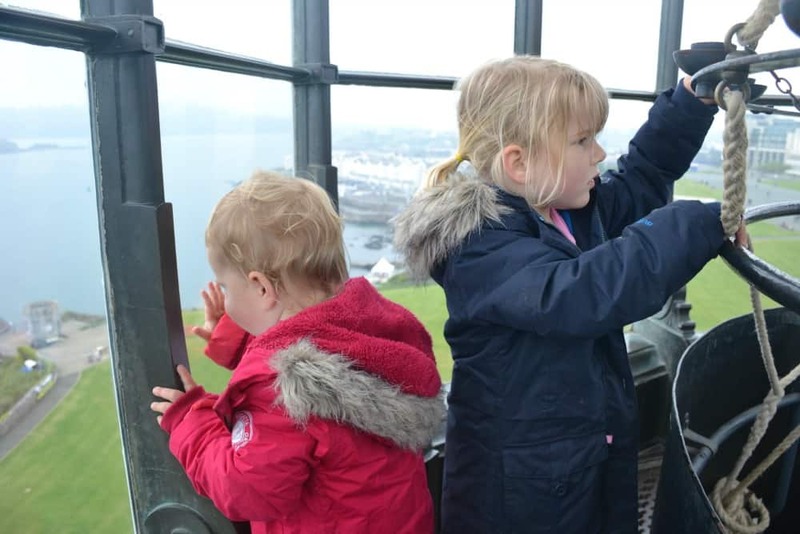 Have you visited a lighthouse with toddlers? 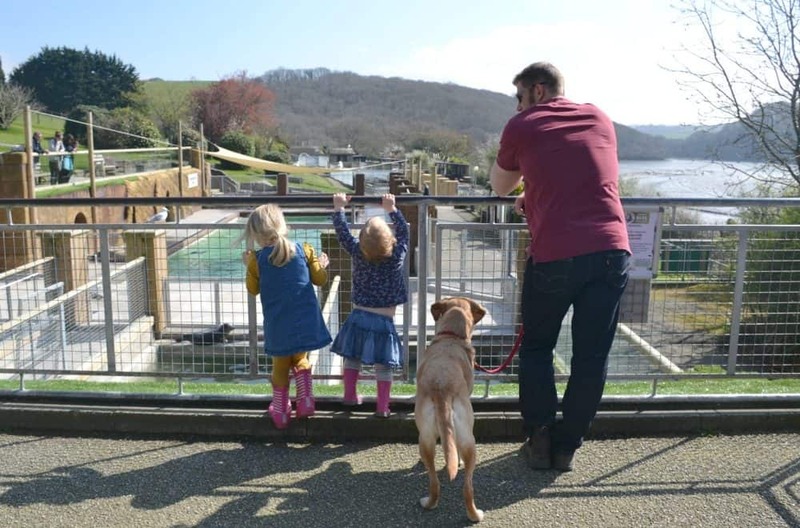 Or can you recommend other places to visit with toddlers in Plymouth? Holidaying in Devon this summer? 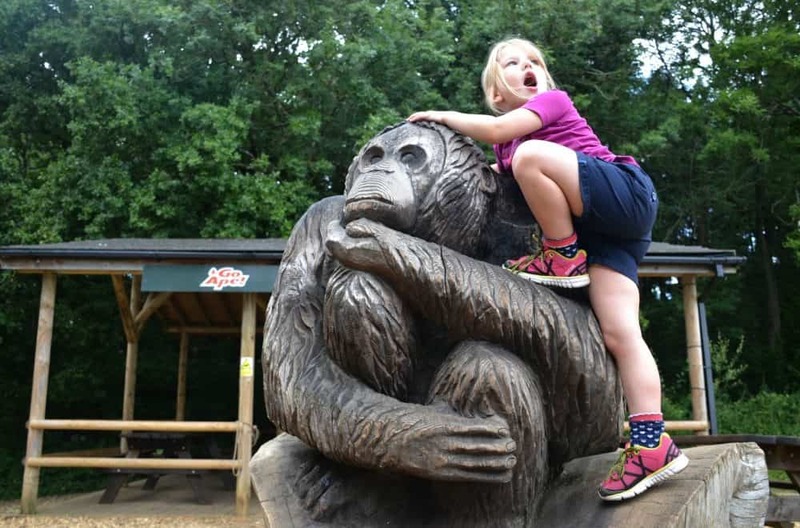 Check out these family-friendly events happening in 2017 or my 55 top Devon days out. That looks so fun – lighthouses are always so fascinating and the red and white stripes are a bonus. I love the fact that you tried it too, it’s always surprising just what kids can manage too. It poured with rain on our last trip to Plymouth but this is on my list for any return. The views are brilliant. We had to give it a go while we were there but I had managed my expectations about getting to the top. I’m so glad we did!